The good news......."News media websites and populist groups have been prolific on social media, using the platforms to surpass mainstream media and promote causes Mr. Soros and his allies oppose." The Bad News.......There will always be an "Entity" like Soro's, he is just one of many on this planet. Oh so many do his bidding for him and never know his name, what he stands for , and the real pain he intends to inflict to make real victims, not just pretend. News media websites and populist groups have been prolific on social media, using the platforms to surpass mainstream media and promote causes Mr. Soros and his allies oppose. "Oppose a leftist and you're a racist." "Oppose a globalist and you're a Russian." That is so interesting, Mueller and Soros saying the "very same thing", wonder how "close" they really are.? 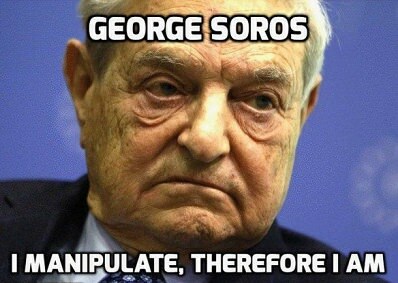 In response, George Soros flipped out, openly suggesting that Salvini might be financed by Vladimir Putin,saying he is "very worried about Russia's influence on Europe in general and on the new Italian government." I do not know if Salvini was funded by Moscow, but the public has a right to know" said Soros. He also admits to being in a 'bubble'. Here's 50 interesting comments to the minute; might be more! Now we know who give$ and keeps on giving and why, eh? George Soros indirectly funded Fusion GPS, the opposition research firm behind the infamous Steele dossier, a spokesman has acknowledged. Michael Vachon, the Soros aide, told Washington Post columnist David Ignatius that Soros provided a grant to a nonprofit group called the Democracy Integrity Project. Clearly a case of Soros Agenda Meets Islamic Agenda. Soros will lose that one for sure. Wow Doka some countries win some loose some against those few ideologists hoping for change that suits them! Before Thanksgiving during the Jim Bohannon Show Jim's guest was an expert with a new book on G. Soros. He said the man survived the Holocaust! When most of the alternate news told us he was a young nazi who distributed confiscated Jewish homes and contents! What's with that conflict in the news?
" In a speech last week, Erdogan accused Soros of trying to sow instability and discord in Turkish society, and of organizing destabilizing protests." Could another fact be that billionaires don't criticize other billionaires? Our POTUS is mum on Soros, as far as I know, to date. Soros supposedly provides the Big Buses for the rioters named Antifa and (some of) the continuing northbound human caravans though Mexico! Last edited by Malaria_Kidd II on 01-04-2019 06:44 AM, edited 1 time in total. "Citizens for Responsibility and Ethics in Washington " what a joke! No wonder people are confused! Their sole purpose is to Destroy Trump..........Destruction is the name of the game, and they "OWN" a good many souls already, the light grows dim. They will stop at nothing ! Do you really think they are going to treat the lowly populace, with respect and dignity? These Devils are striving to be your new "Caretakers". They love you enough to destroy you! A government watchdog group claiming to be "nonpartisan" - while sharing employees with Democratic activist group Media Matters, accepted $1.35 million from billionaire George Soros. The group, Citizens for Responsibility and Ethics in Washington (CREW), has hit President Trump and other prominent Republicans with high-profile lawsuits, while its members appear regularly on television to attack members of the administration. Founded by Normal Eisen - a law school classmate of former President Obama (who became Obama's ambassador to the Czech Republic), and longitme Democrat operative Melanie Sloan, CREW accepted donations from two Soros groups; $1.25 million from the Foundation to Promote Open Society, and $100,000 from the Open Society Policy Center, according to the Washington Free Beacon, which obtained tax filings for the watchdog group. While this year's now-concluded World Economic Forum conference in Davos was mostly a dud and increasingly a joke in financial circles, with Deutsche Bank's Jim Reid going so far as admitting that "we had a DB drinks reception for our clients last night and one said to me that in 11 years of coming here the best advice would be to trade in the opposite direction to the main theme of the conference over the next 12 months", there was one event that boondoggling billionaires were eagerly anticipating: George Soros' annual remarks. And, as we reported previously, one year after he famously slammed Google and Facebook at Davos 2018, calling them a "menace" and "monopolistic" and predicting it's "only a matter of time before the global dominance of the US IT monopolies is broken," this time Soros took aim at what he believes is an even greater adversary, one which even Donald Trump might agree with: China. "China is not the only authoritarian regime in the world but it is the wealthiest, strongest and technologically most advanced,” Soros lashed out at Beijing, while taking particular aim at China's president: "This makes Xi Jinping the most dangerous opponent of open societies." Yet while Soros' aggressive 3295-word attack on China took many by surprise, what was just as notable was China's response to Soros' scathing criticism: there was none. In fact, China made it quite clear that in its opinion, Soros is no longer relevant saying that "statements by certain people, which portray black as white and distort facts, are completely pointless and not worthy of even a rebuttal."